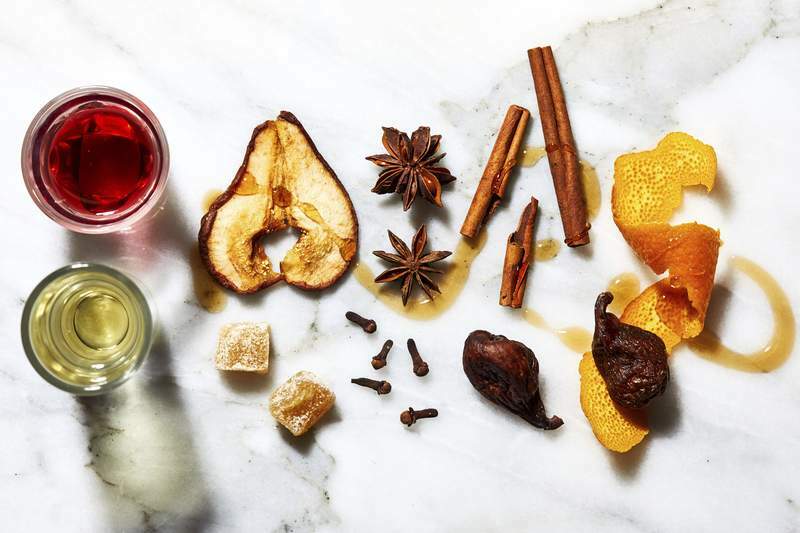 Photo for the Washington Post by Stacy Zarin Goldberg There are plenty of flavor options available for making a great mulled beverage. Forget the Pumpkin Spice Latte (or PSL, or Pretty Sad Latte). The real seasonal spiced drinks we should be celebrating this time of year are mulled beverages. After all, if pumpkin-ish coffee can hit shops in August, can't you start sipping its far superior – and boozier – cousins as soon as the evenings start getting chilly? Of course you can – and no one's going to stop you. Who better to turn to for some seasonal cheer and advice than Paul Taylor? He's the head of bar concepts for Drink Company, the Washington, D.C., outfit that puts on the massively popular, line-out-the-door Miracle on 7th Street holiday bonanza at its Pop Up Bar (PUB). Taylor recommends wine and cider as your prime candidates for mulling. As to what they ultimately taste like, that's up to you. • Pick the right beverage. You've heard the maxim about cooking with wine that you'd be fine drinking. Same idea here: “You definitely want it to be something you want to drink” even before mulling, Taylor says. There may be the temptation to chuck in the dregs of several bottles with some spices and call it a day, but he advises putting a little more thought into it. Try to pick a “quaffable wine,” which is not necessarily expensive, he says. Affordable is appealing because you're going to be doctoring it anyway. For red, he likes to go with something unoaked, such as a pinot noir or a gamay, both of which are “a good canvas to add spices to.” And yes, you can mull a white wine. Aim for something with medium to light body, such as a sauvignon blanc. Taylor recommends mulling cider, too. A drier cider is preferable, and though it's not a must, one that has less carbonation is a bonus because you're going to lose the bubbles anyway. A few labels he likes are Washington-based Anxo, Graft (New York) and Shacksbury (Vermont), the last of which he describes as having a pear-skin flavor. • Then start blending. Plan to add something to dilute the alcohol, at least a little. After all, you want to be able to make it through the evening upright. (Taylor also raises the point that heating alcohol amplifies the taste of the alcohol.) Water is one possibility. Taylor says apple or another complementary juice can work, as well as tea. Or be like the Spanish, and try mixing in a soft drink with your wine (see: kalimotxo, a combination of red wine and cola). A rough guide to keep in mind is two parts wine to 3/4 parts cutting agent. So for two 750 milliliter bottles of wine (50 ounces total), Taylor suggests 18 to 20 ounces of water, juice, and so on. You can also add 3 to 4 ounces of your choice of spirits, such as cognac or Grand Marnier. If you're using a white wine, pisco is a suitable addition. The natural pairing for a hard cider in a mulled beverage is apple juice. Choose an unsweetened juice, which jibes with Taylor's philosophy that you should be using as bare-bones ingredients as you can so that you have the most control. Because cider typically has less alcohol than wine, you can tweak the ratios a bit, more like 2 parts cider to 1/2 part juice (or 50 ounces cider to 12 or 13 ounces juice, if we're sticking with the same amounts as above). • Add seasonings to taste. Gentle aroma and flavors of fall spices are good. Wine that smells and tastes like potpourri is bad. One way to get the balance right is to follow the above advice: Start with whole spices – ground spices make things cloudy and thick – and don't use packaged blends. (Toast them first for extra flavor.) Choose what you like and what you think works with your wine. Cinnamon stick, star anise, cloves and allspice are all appropriate. Don't forget about cardamom either, which Taylor says complements white wine. Beyond dry spices, look to citrus peel, fresh ginger and cranberries for pops of flavor. You'll probably want some sweetener. Sugar is universal. If you want to go next-level, Taylor suggests trying maple syrup or sorghum. • Heat, and taste along the way. I know how disappointed you're going to be when I tell you to taste your beverage as you cook it. Such a hardship! That's the only way you'll know whether you need to adjust the blend or the flavors. When you're heating the drink, you don't want to boil away the alcohol. Taylor recommends not going above 160 degrees, which means you'll want to keep your burner on a relatively low heat. Half an hour is often sufficient to heat the beverage and infuse it with the spices, but if you taste it and feel like it needs more time, keep simmering. • Serve and garnish. Coffee urns and slow cookers are great for ensuring the beverage stays warm throughout the evening. Portion some out in a punch bowl and replenish as needed. The sweet spot for serving is also in the 150- to 160-degree range. Think about it like this: You want the beverage hot enough that you wouldn't want to chug it. Like coffee, it will hit the sweet spot for drinking a few minutes after it's poured. In the meantime, enjoy the warm cup in your hand and the wonderful aromas. As for how to serve it, I'm not going to judge you if you want to have people sip out of your motley assortment of 15 years' worth of coffee mugs. That's called character. If your mugs match, more power to you. Heatproof glassware is good, too, Taylor says. Don't have a set? They may be cliché, but Mason jars – obviously heatproof since you boil them in a water bath for canning – are cheap, easy and versatile. When it comes to garnishing, you can choose to echo what's in your drink, whether that's a cinnamon stick or star anise. That could also be in the form of a twist of orange peel or a wedge of the fruit. If you used maple syrup, try the whimsy of a piece of maple candy (sorry, Mimi Sheraton, we said it). Dried pears or apples would be pretty and seasonal. Crystallized ginger brings flash and flavor.